Diversification helps investors to mitigate the risk and volatility of their investment portfolio, potentially reducing the number of ups and downs of the market. This is the reason financial experts suggest to diversify every investor’s portfolio to include variety investments options. Now that we have seen best ELSS & Mid cap funds in my previous posts, now let’s look at best Diversified mutual funds. Diversified Equity Mutual Funds are those that spread their investments across sectors e.g. Banking, IT, Pharma, Oil & Gas, Real Estate, FMCG, Telecom, etc. They diversify their investments across most of the sectors, and thus they minimize the risk of over-concentration in any one particular sector. Multi-cap or Diversified mutual funds invests in all categories of market capitalization like large caps, mid caps & small caps. Over the long term, diversified equity mutual funds have had the best returns track records. There is nothing like starting early in your investing life, use the power of compounding to your benefit. To understand the power of compounding, consider this excellent article here. Now that you have learned how to choose the best mutual fund, I have used the same strategy to select these Diversified mutual funds or Multi-cap Mutual funds. Here are few critical selection parameters as mentioned below. All other selection considerations are explained in my post here. 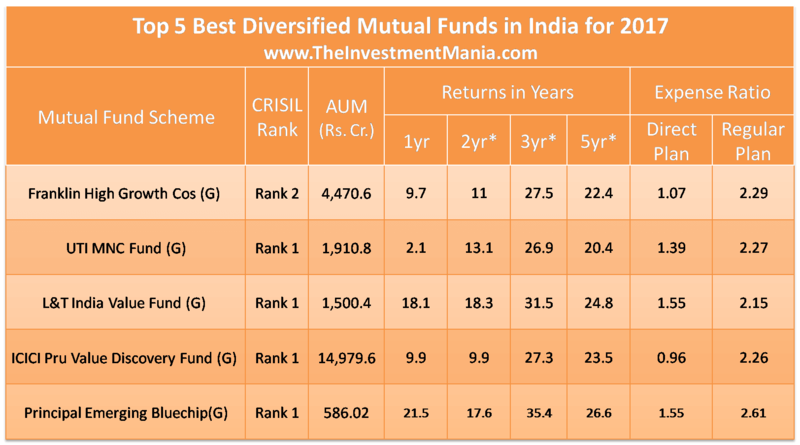 Now let’s see top 5 best diversified mutual funds in India for 2017. Below is the overall description of top mutual funds. Now I want to show you complete information of each mutual fund. I have compiled a list as below for all the information related to these funds. You can notice that performance of these funds is almost similar over the last five years. As shown below all funds have performed very well since last five years. Now let’s see each diversified mutual funds in detail. The Principal Emerging Bluechip Fund was launched during the financial crisis in November 2008 and has given excellent returns to its investors since its inception. The fund has Rs. 563 crores of assets under management. The expense ratio of Principal Emerging fund is 2.61% (Regular) and 1.76% (Direct plan). Dhimant Shah manages the fund. Fund has managed to keep CRISIL rank of 1 from last one year. The fund is suitable for investors planning to make investments for long- term financial goals, like wealth creation, children’s education, retirement planning, etc. As another fund, it is open for both growth and dividend options. Expense Ratio for Direct Plan is 1.76 percent, and for Regular Plan it is 2.61percent. I would advise you to invest in a direct plan to get more returns in the long term. Portfolio Composition – The fund has a mid-cap oriented focus. The fund invests ~74% to midcap & 13% to small cap. The portfolio is overweight on Banking, Pharmaceuticals & Industrial Products; these three sectors make a massive 29% to the overall portfolio. The portfolio is very well diversified concerning company & sector concentration. The top 5 companies in the fund portfolio, Eicher Motors, Amara Raja Batteries, Motherson Sumi, Gabriel India, Dynamatic Technologies account for only 10% of the portfolio value. The Principal Emerging Bluechip Fund has the potential to deliver excellent returns over the short to medium term. Returns – Returns since inception are 29.65%. 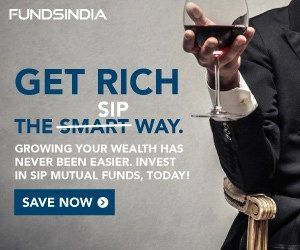 If you started SIP in this fund five years ago with Rs.1000 monthly, then your investment would have grown to Rs.1.20 lakhs with CAGR of 28.95%. The annualized returns over the last 3 and five years are 31.2% and 26.0% consequently, in which it is on top of the diversified fund list. Franklin High Growth Companies Fund is another best performing fund in the diversified company. This fund invest in High growth companies that have expanded their sales, in addition to earnings, at a higher rate than that of the general economy. These companies tend to grow earnings at a fast pace; they typically have higher valuations (P/E- Price to earnings ratio). This fund was launched on July 26, 2007. Roshi Jain & Anand Radhakrishnan manages the fund (w.e.f. May 02, 2016). Both of these fund managers are managing several other funds from this AMC. They have an excellent track record of giving good returns in every phase of the market. AUM of this fund is Rs. 4470 Cr. which shows it’s large customer base. Fund Returns -As I have explained in the previous post regarding returns of this fund, lump-sum investment of Rs.1,000 in this fund five years ago would have grown to Rs. 1,814 by November 18, 2016 (absolute returns of 181.4%). The annualized returns over the last 3 and five years are 26.8% and 23.0% consequently, which is, of course, excellent. For instance, Rs 1,000 SIP started in the fund five years ago would have given you Rs. 101,393 (where you have invested only Rs. 60,000) whereas a similar investment in the NIFTY CNX500 Index has returned 13.2% and 12.3% respectively. The expense ratio for this fund is 2.29% for Regular Plan & 1.07% for Direct Plan (as on 31st October 2016). This Diversified mutual fund does not charge any entry load but, it charges 1% exit load if units are redeemed within two years of investment. Launched in May 1998, UTI MNC Fund has been consistently ranked as Rank 1 from CRISIL under the Diversified mutual fund’s Equity category. The person behind this fund is Swati Kulkarni; She has a professional experience of 20 years, 19 years of which she has worked for UTI mutual funds. “Outlook Money” in 2010 recognized Swati among the top 3 India’s Best Fund Managers in Equity category. This fund aims at creating value for the investor by investing mainly in equities of large-cap and mid-cap multinational companies (MNCs) across diverse sectors. Fund Returns -As I have explained in the previous post regarding returns of this fund, lump-sum investment of Rs. 1,000 in this fund five years ago would have grown to Rs. 1,474 by November 26, 2016 (absolute returns of 147.4%). The annualized returns over the last 3 and five years are 23.5% and 19.8% consequently, which is apparently excellent. For instance, Rs 1,000 SIP started in the fund five years ago would have given you Rs 91,762 (where you have invested only Rs 60,000) whereas a similar investment in the NIFTY MNC Index has returned 17.4% and 15.9% respectively. The expense ratio for this fund is 2.27% for Regular Plan & 1.39% for Direct Plan (as on 31st October 2016). Similar to Franklin India this fund does not charge any entry load. Started in January 2010, L&T India Value Fund is managed by Venugopal Manghat (since 2012) has mostly been in the top 3 quartiles of the equity fund performance chart. Portfolio -L&T India Value Fund has a right mix of various sectors and across the market cap. It has 38.10 percent in large cap, 34.37 percent in mid-cap and 27.53 percent in small cap. They have massive 26.53 percent in Banking/Finance sector, which is, of course, best performing sector currently. Major stocks in its portfolio are HPCL, State Bank of India, Manappuram Finance and ICICI Bank, etc. Performance – L&T India Value Fund shot up performance charts in the last one to three years as a result of more focus towards banking sector and very adept stocks. As a result, this fund has comfortably beaten its category average over last 1, 2, 3 and 5-year time frame. Fund Returns -As I have explained in the previous post regarding returns of this fund, lump-sum investment of Rs. 1,000 in this fund five years ago would have grown to Rs. 1,979 by November 26, 2016 (absolute returns of 197.9%). The annualized returns over the last 3 and five years are 31.5% and 24.8% consequently, which is, of course, excellent. For instance, Rs 1,000 SIP started in the fund five years ago would have given you Rs 110,346 (where you have invested only Rs 60,000) whereas a similar investment in the NIFTY MNC Index has returned 12.8% and 12.9% respectively. The expense ratio for this fund is 2.15% for Regular Plan & 1.55% for Direct Plan (as on 31st October 2016). Similar to other funds does not charge any entry load. This fund was launched in August 2004, ICICI Prudential Value Discovery Fund is classified under the diversified mutual fund’s category, and has been CRISIL ranked number 1 or 2 for the last 3-5 years. Mrinal Singh is managing the fund since February 2011, had average quarterly assets under management (AUM) of Rs 12,449 crore as on 3 December 2016. While the fund has large to giant cap bias, the fund also has a significant allocation to mid cap stocks. The portfolio is overweight on banking sector with 19.80 percent. Regarding company concentration, the top 5 companies, HDFC Bank (7.94 percent), Wipro (6.88 percent), Larsen (6.57 percent), ICICI Bank (5.96 percent) and Infosys (5.75 percent) accounts for only 33 percent the total portfolio value. ICICI Prudential Value Discovery Fund has given 22.39% returns since its inception. The fund scores above most of its peers in the small and midcap category in terms of consistency of performance. CRISIL has ranked this fund number 1 in diversified mutual fund category in the quarter ended June 2016, up from its rank two from many years. The fund has outperformed the benchmark S&P BSE 500 in 1, 3, 5 and ten years getting excellent returns of 4.39, 26.50, 22.74 and 16.04 respectively, whereas fund has given 3.71, 12.81, 11.55 and 7.75. Also, the fund has outperformed the category and the benchmark during both bull run and bear run market cycles. This fund is ranked number 1 in 5 and ten years in terms of returns within diversified mutual fund category. Furthermore, a monthly investment of Rs 1,000 since inception (principal of Rs 1.48 lakhs) via SIP would have grown to Rs 5.39 lakhs by 3rd December 2016. SIP of Rs 1000 in this fund five years ago would have given you 1.01 lacs, where you have invested only Rs. 60,000 . Investors, those who are looking for long-term capital appreciation, can consider investing in diversified mutual funds schemes through the systematic investment plan (SIP). Furthermore, investors should note that midcap funds are intrinsically more risky than large cap funds, but they have the great potential to give higher returns in the long term. Disclaimer – We are not associated with any mutual fund AMC. All these are my views. Mutual Fund Investments are subject to market risks, read all scheme related documents carefully. 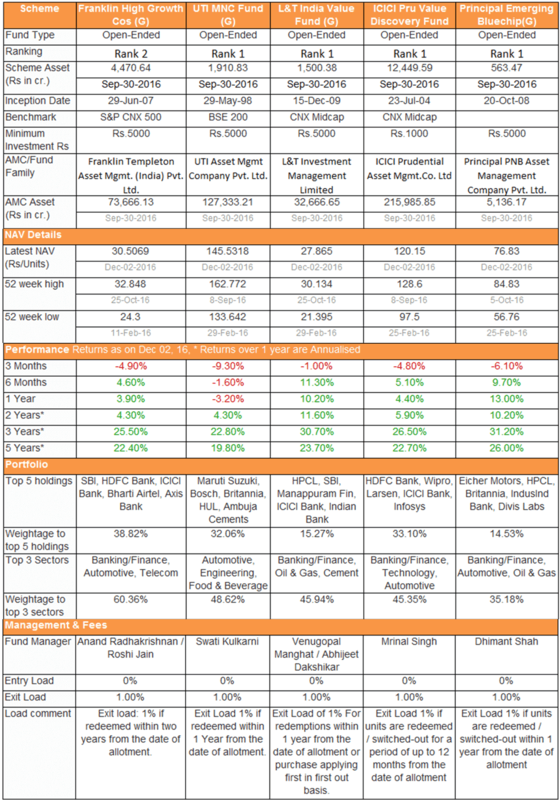 Good review of all best diversified mutual funds. I already have 2 of them in my portfolio. Why franklin is at number 1 on the list when it has crisil rank of 2. Hi J Biswas, CRISIL rank changes every quarter. If you see past performance of this fund, then definitely this is one of the best fund. It has performed very well in all phases of market than other funds. CRISIL rank keep changing but you should also look that it regains rank 1 in next few quarters. Also Rank is one the factor, not sole. There are lot of other factors to check performance of the fund as I have explained in my previous post of How to Choose the Best Mutual Fund. Sir, I am already invested 2500 SIP in UTI fund from last 1 year but i am not getting good returns. Can i sell this fund and invest in some other fund. Hey Harish, UTI MNC Fund is good. Mutual funds are for the long term, so do not just see returns over the last 1 year. I would advise you to check it’s returns with the benchmark. Also if you see all mutual funds have given very less return in last year because Sensex corrected almost 10% from it’s high in last year, this is the reason you are getting fewer returns. But looking ahead to 2017, outlook looks good for the Indian economy, so stay invested!